A new release of Harp is available today. We’re happily adding one of Harp’s most-requested features: built-in preprocessing of Sass’ indented syntax. Now, you can write .sass files and they will be implicitly preprocessed as .css files, without any configuration necessary. This works exactly the same as with .scss, .styl, and .less files. If you get v0.10.x (where x is any number), then you are ready. If you get v0.8.x, you will need to upgrade to the latest version of Node. Just visit the Node website, download, and install the latest version. Now you’re ready to install Harp. You may need to use sudo npm install -g harp depending on your setup. (You may also want to take a look at the quick start guide.) 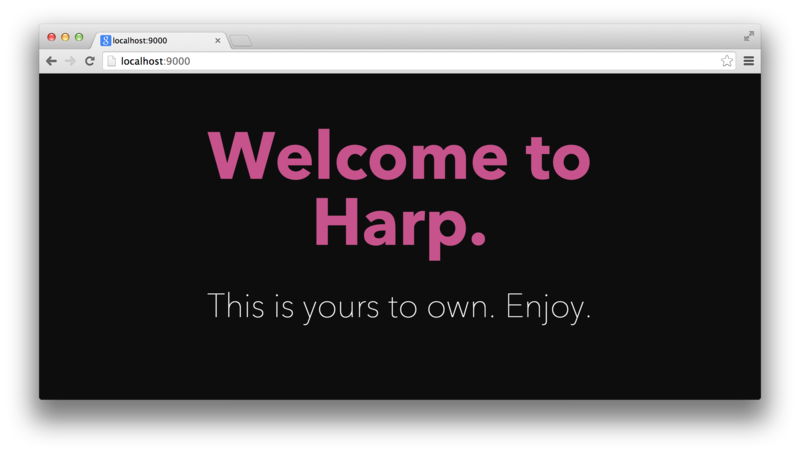 Now, you’re ready to try out Harp v0.13.0. Now, the code for your new, Sass-based boilerplate is stored in the my-proj/ folder, and is available in your browser at localhost:9000. There’s more examples in the full documentation for .sass. Sass’ .sass files can still import .scss files, and vice-versa. This means you can still use your favourite Sass libraries like Bourbon or Foundation 5 even if you’d prefer to write your site or app using the indented syntax. We wrote about trying out Harp with Foundation or Bourbon & Neat, and it will work the same with the new .sass support. Every CSS preprocessor has also been upgraded for this release of Harp. Node-sass is now at version 0.9.3, which updates Libsass to 2.0. This adds lots of bug fixes, gave us the ability to add .sass support, Sass 3.3’s BEM syntax support, and more. LESS is now at version 1.7.3, which includes bug fixes. Stylus is now at version 0.47.2, which adds better color functions, nested media query support, more CSS-like syntax variants, basic support for most at-rules, performance tuning, and more. Harp also helps power the Harp Platform, a front-end publishing platform integrated with Dropbox. It’s the fastest way to deploy your new project—you’ll never need to flatten your Sass source files. We haven’t been posting on the Harp blog as much, but we have been just as involved with the community and are happy to see Harp more popular than ever. We have more planned for Harp in the near future. If you’d like to be the first to know about it, follow Harp on Twitter.